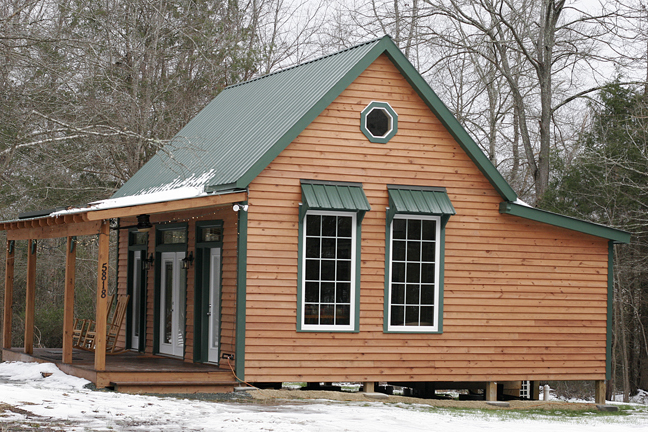 We worked with an architect to create the plans for this cabin that SWD then built from the ground up. 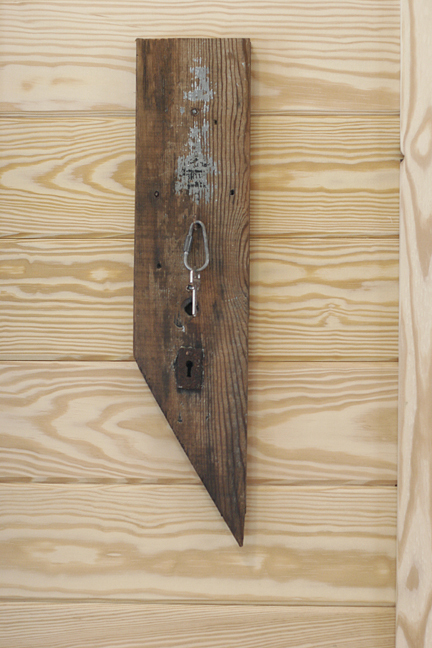 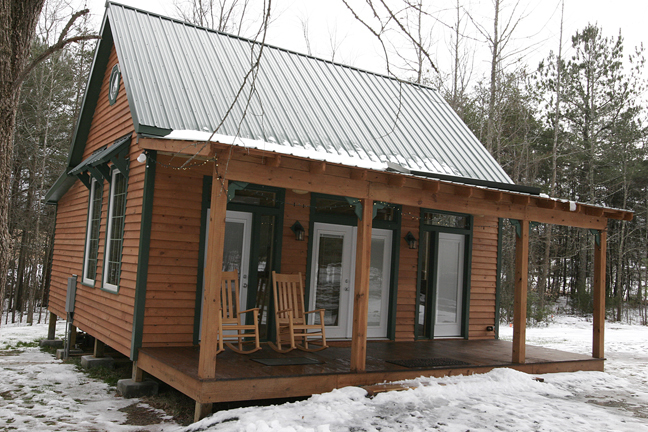 From the very first concept meetings this cabin was meant to feature customized artistic elements that would make it a unique building project. 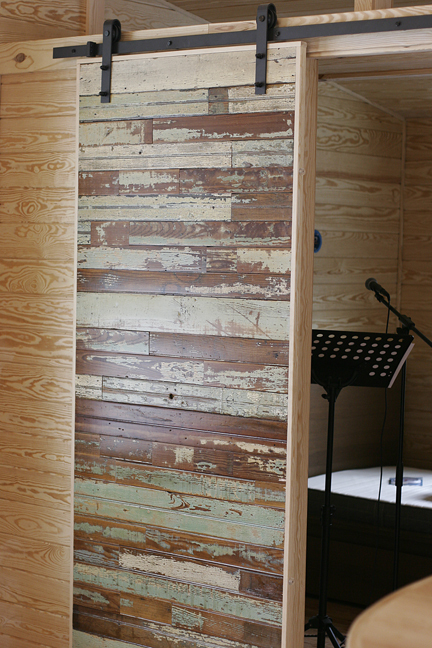 We recovered and reused weathered boards from the barn on this historic property in the design and creation of all the wood mosaic sliding barn doors on the interior. 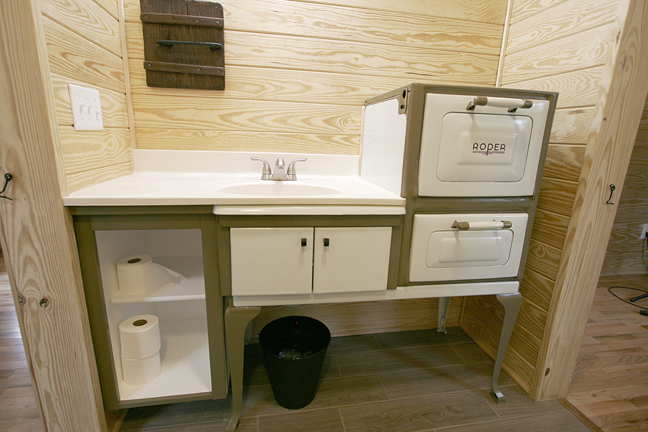 We re-purposed the original 1925 farmhouse oven to create the fully-customized bathroom vanity, making the former oven area into linen storage and the former gas cooktop area into the sink. 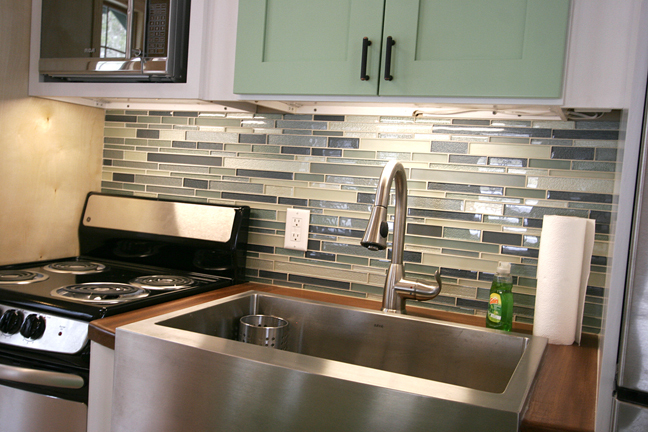 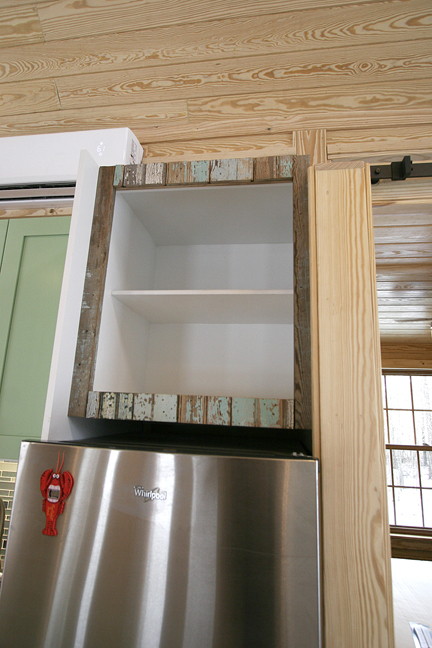 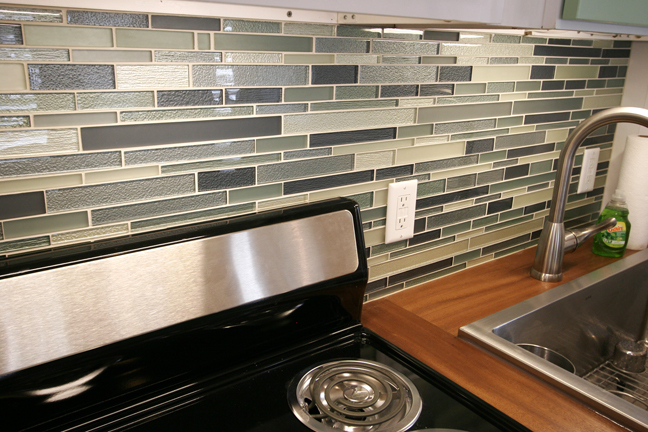 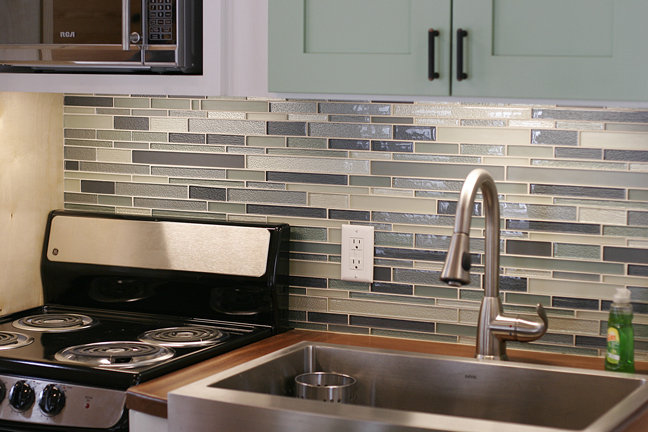 The kitchen cabinets were painted to harmonize with the mosaic barn wood doors on either side and the glass mosaic tile backsplash completes the look. 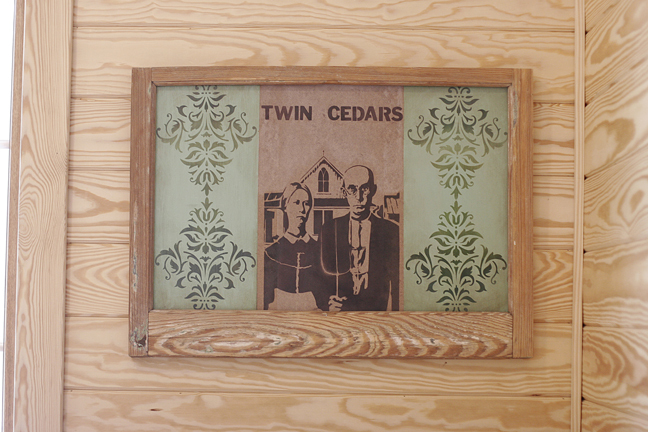 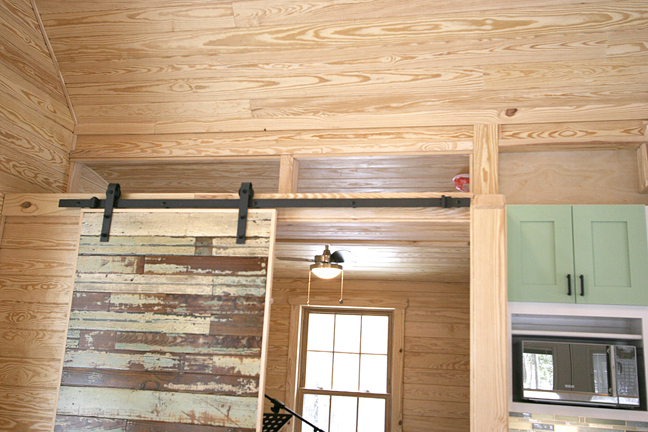 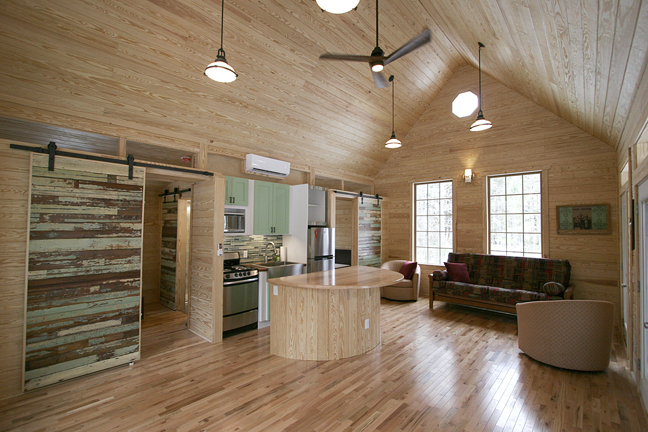 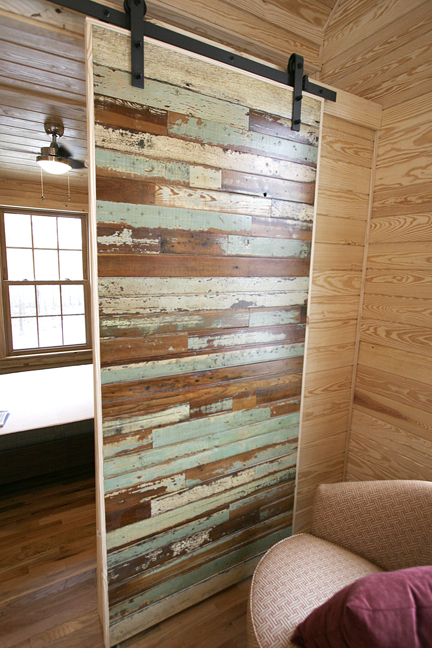 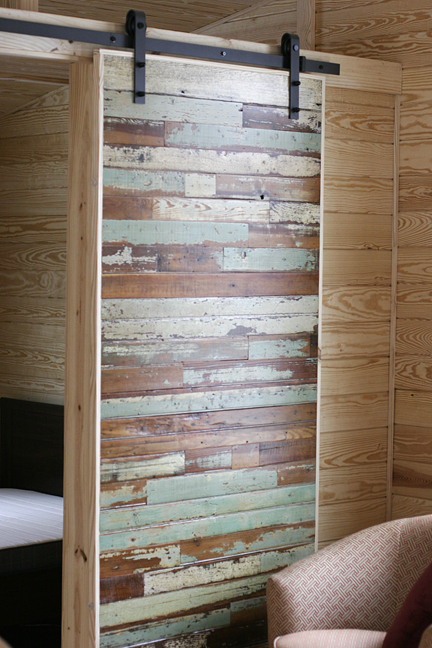 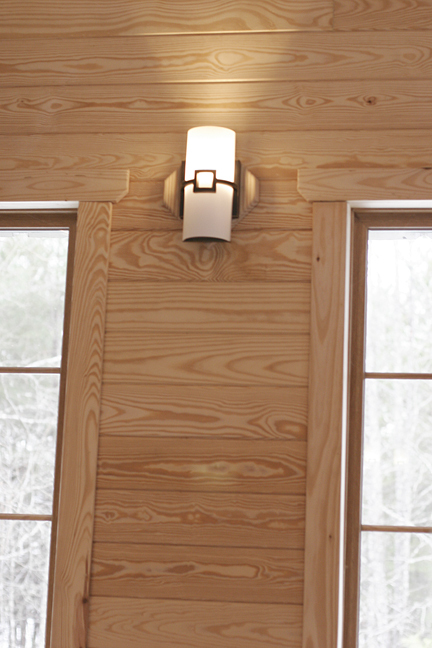 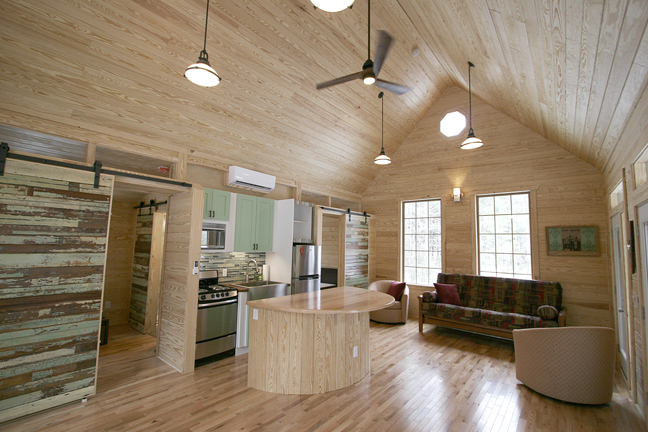 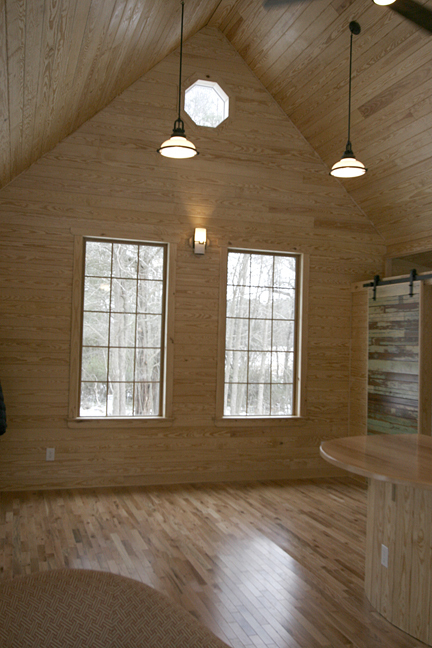 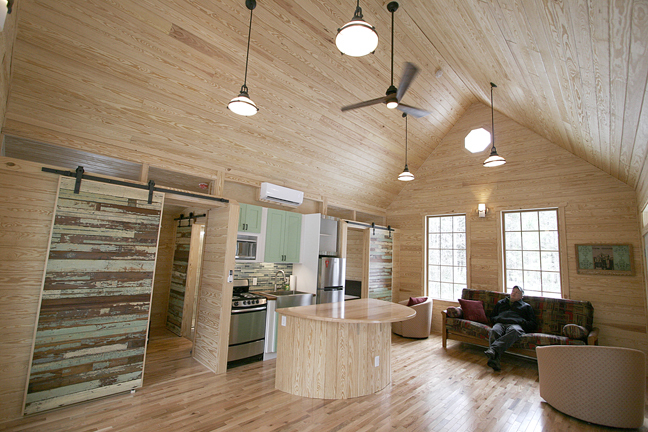 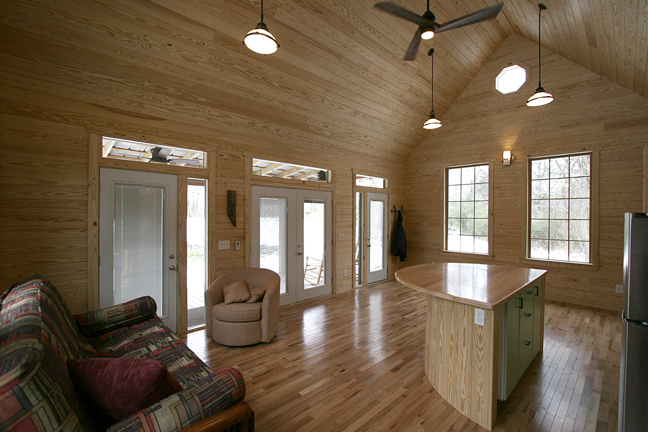 #1 pine boards cover the interior walls up through the raised “great room” ceiling. 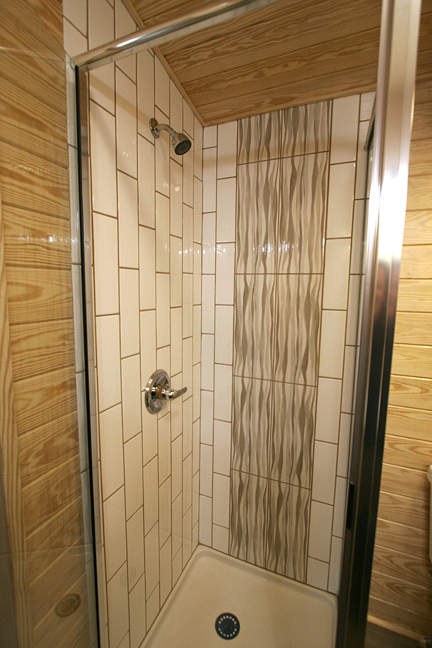 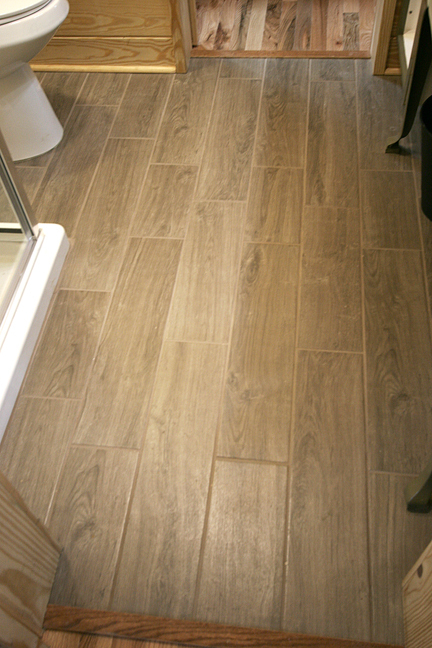 Two pine bedrooms flank the bathroom that features a tile mosaic in the shower. 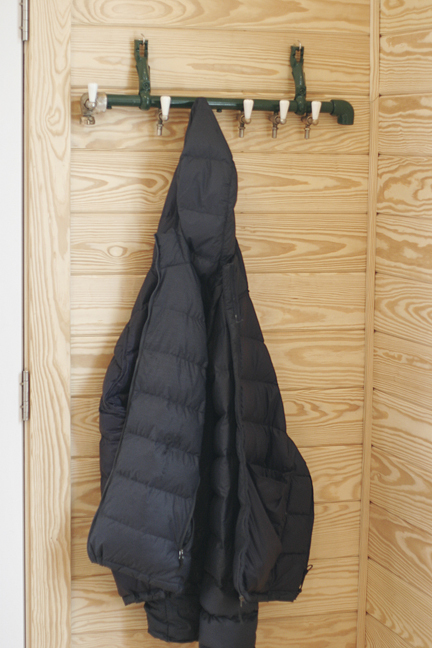 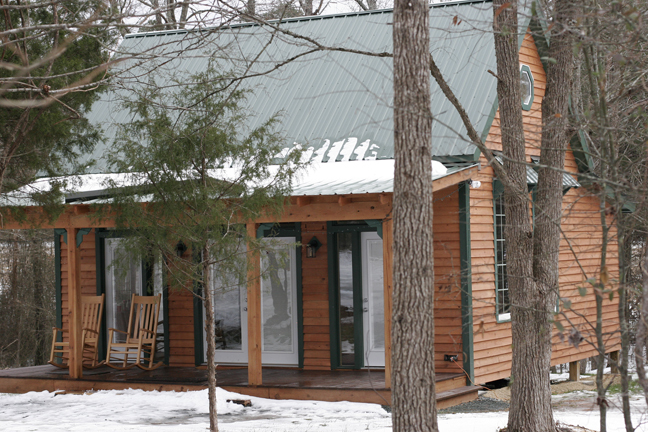 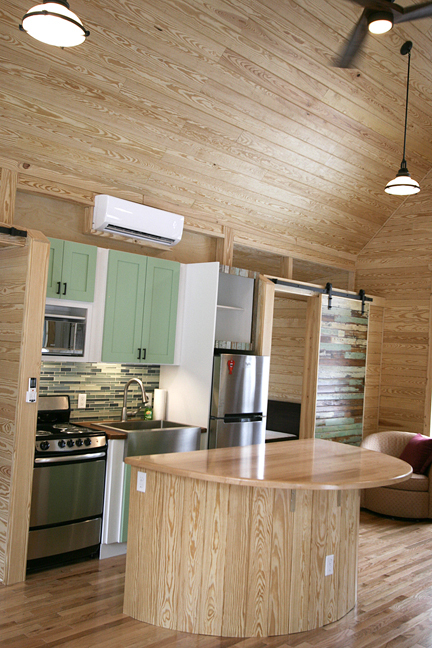 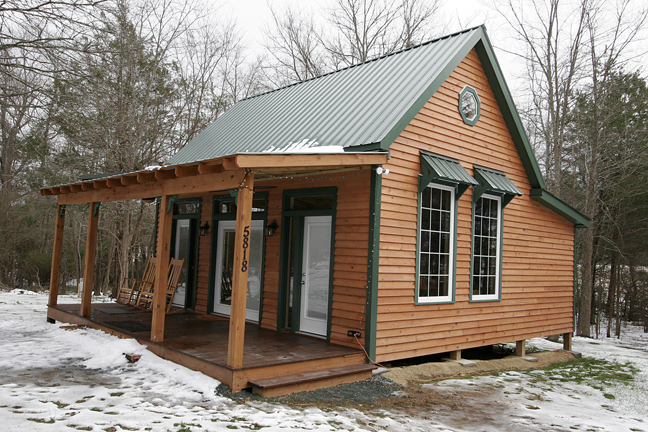 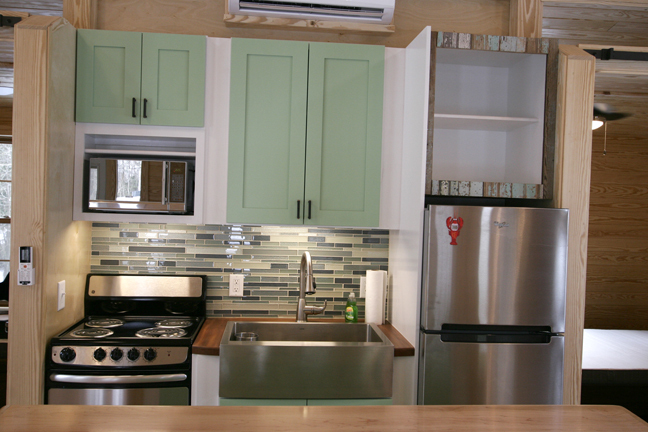 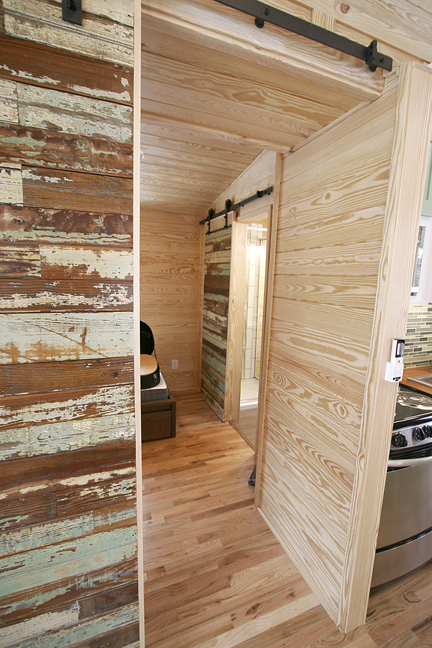 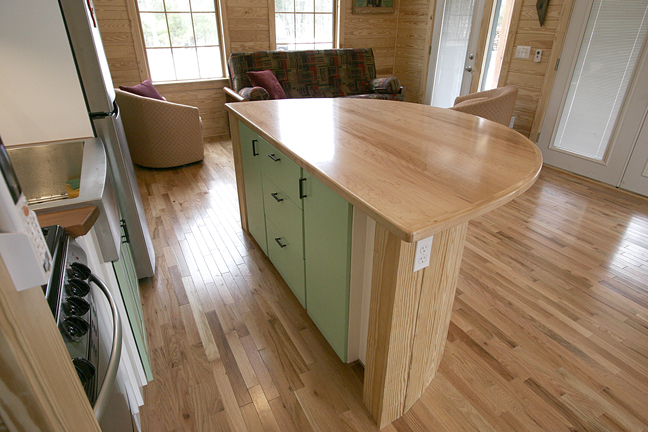 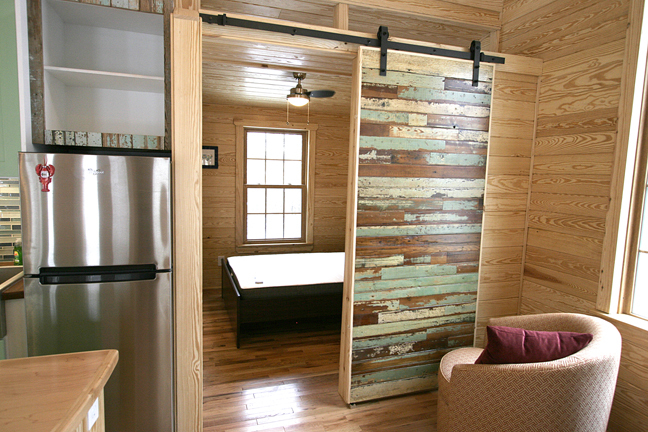 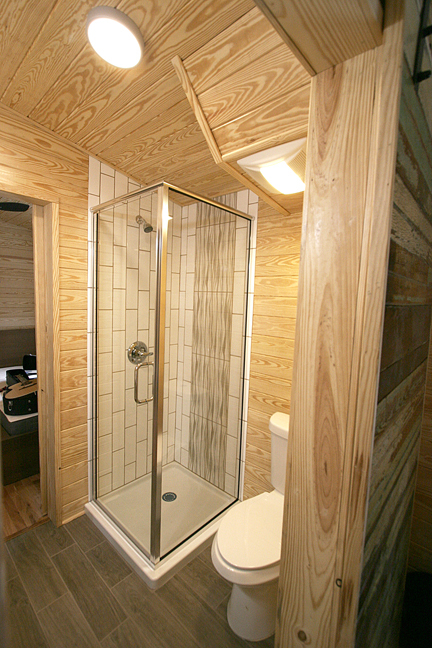 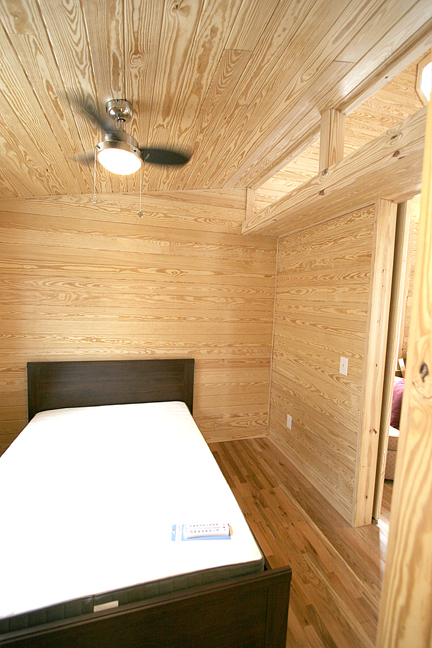 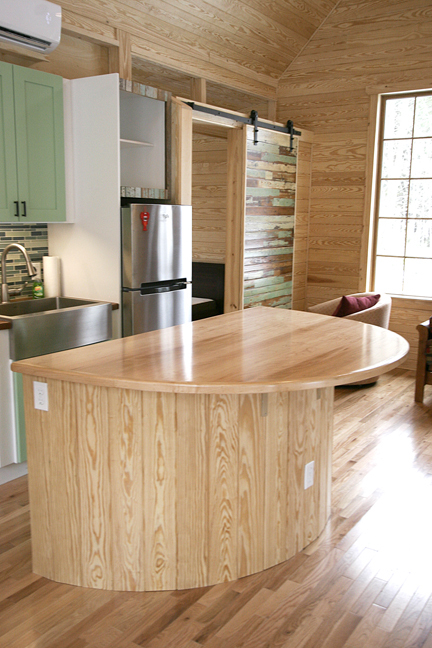 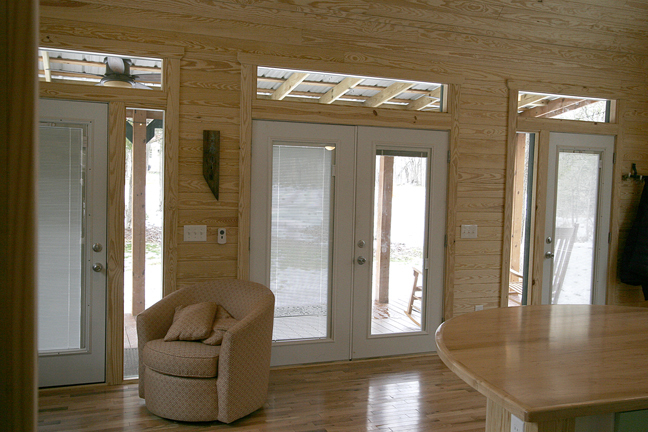 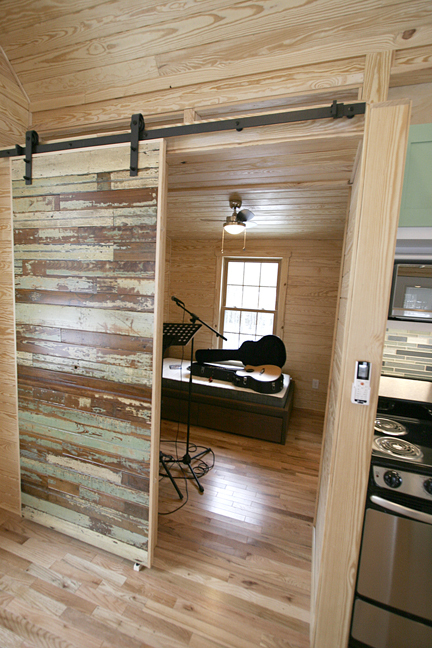 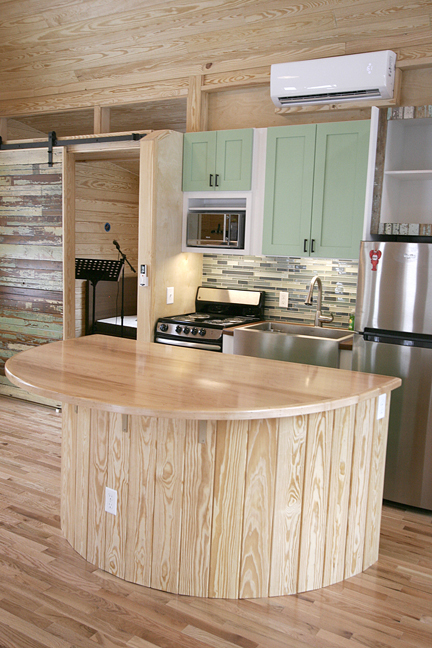 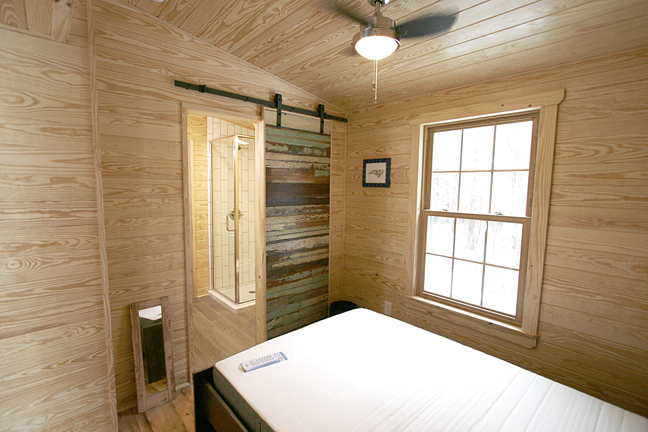 We worked within our client’s budget so that the small footprint of this cabin (584 sq/ft.) 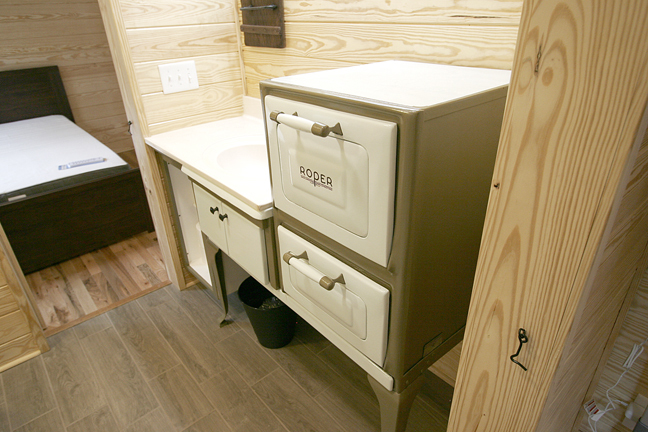 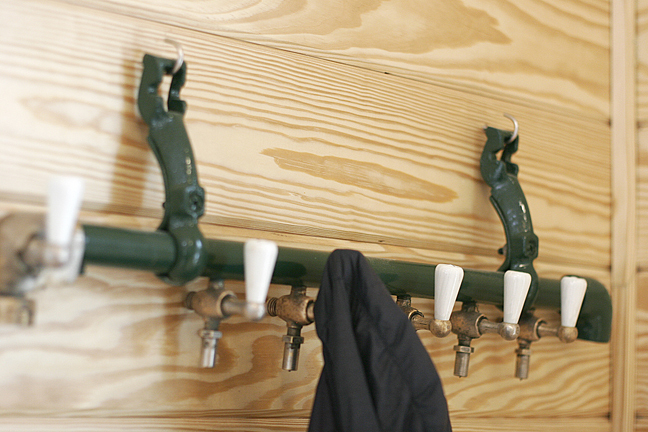 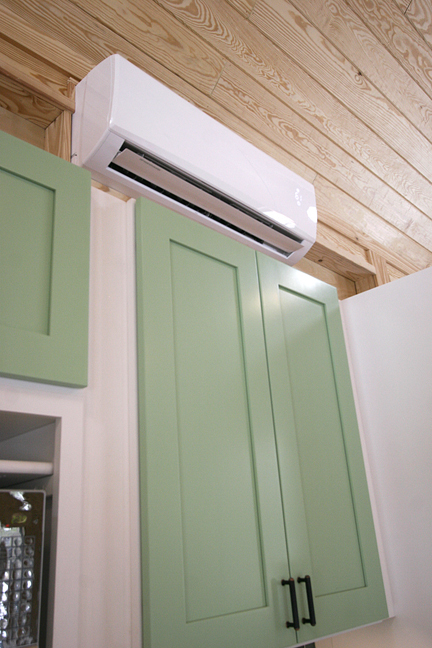 would feel like a large space by incorporating smart designs for a compact space. 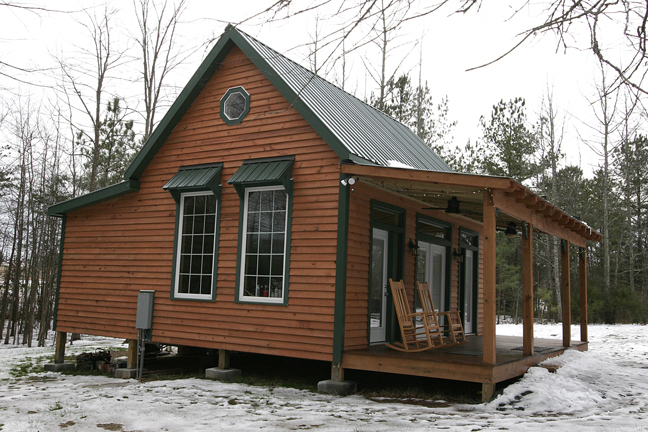 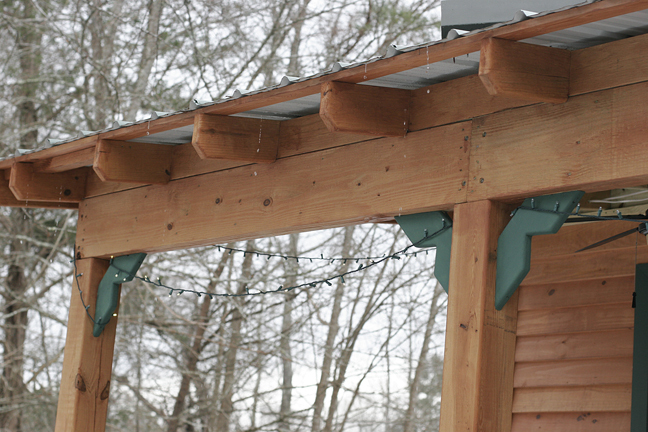 The exterior of the cabin was also carefully and creatively planned. 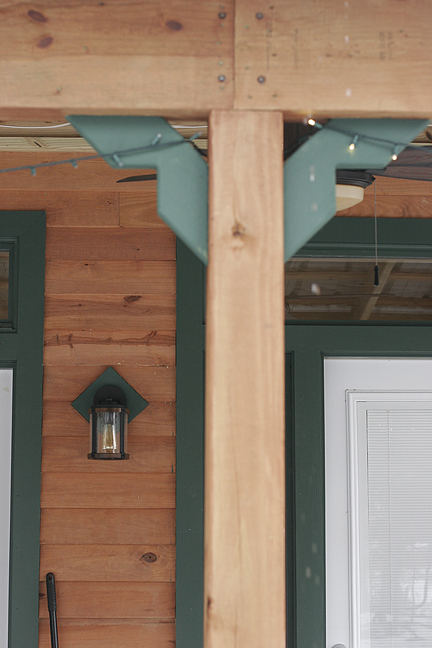 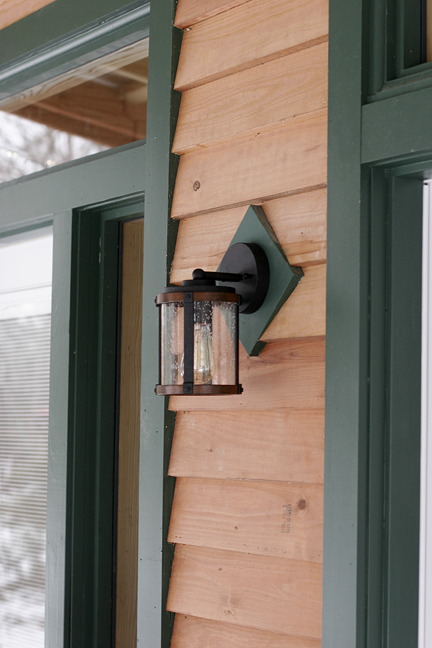 The custom-made details of the aesthetic window awnings match the porch’s custom-made filligree details and the bases of the exterior sconce lights. 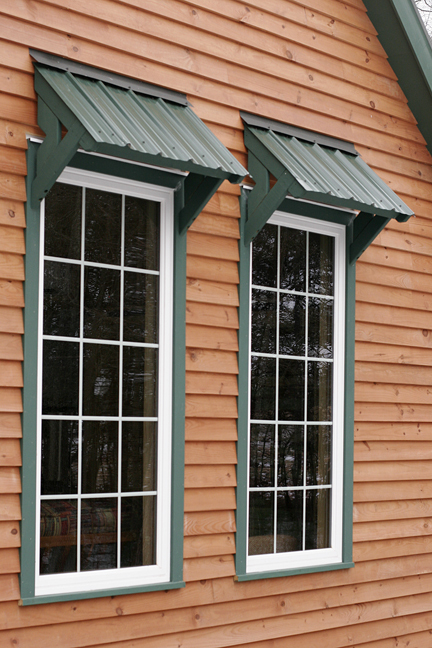 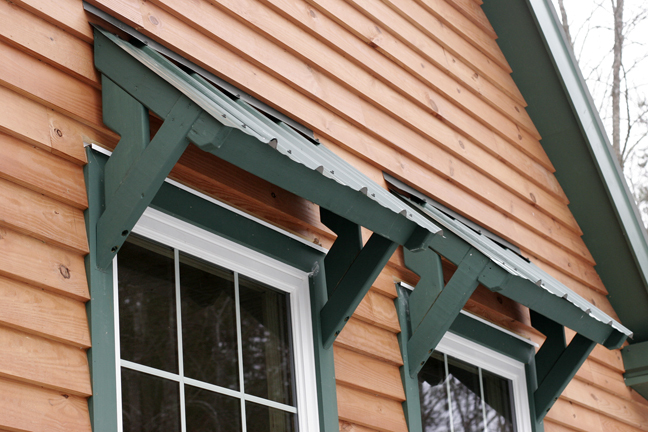 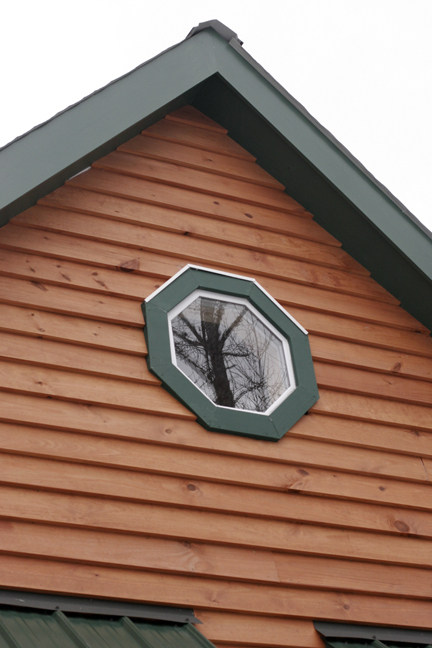 Contrasting colored wood trim surrounds the large main windows, full light doors and hexagonal upper windows. 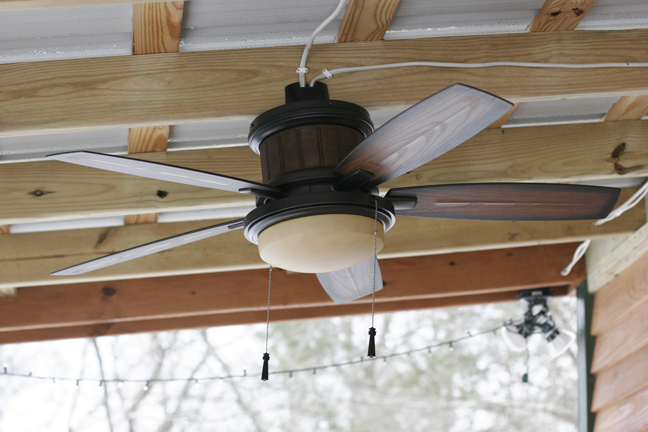 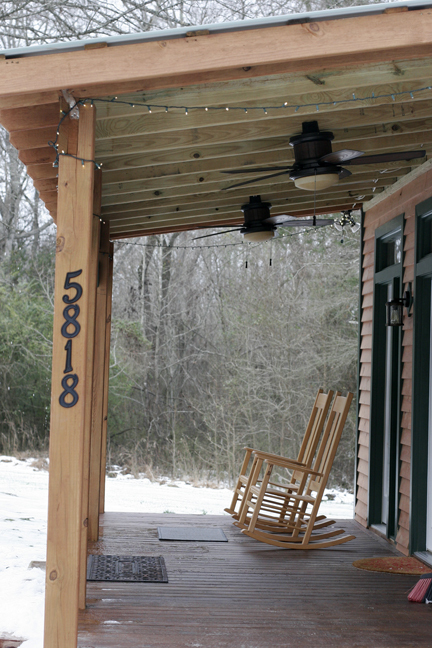 The porch is sized large enough for lounging and exterior ceiling fans keep it cool in the summer months.